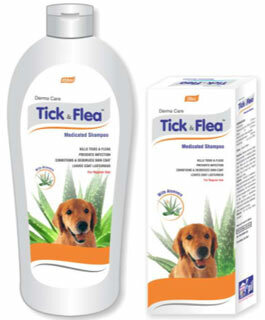 Tick & Flea soap /shampoo helps cure Flea Bite Dermatitis and Advanced Seborrhea in pets.Tick & Flea soap /shampoo is a dual purpose shampoo: Permethrin repels insects & mites that infest dog skin, while Coal Tar relieves itching caused by them.Helps cure inflammation or rash caused by mites. Controls itching and compulsive scratching. Application: Use once a month for flea treatment of dogs.Wet coat and lather into the coat generously. Leave for about 2 minutes. Rinse thoroughly. Prevent from entering into eyes, ears & mouth. Precautions: FOR DOG USE ONLY, DO NOT USE ON CATS. Ensure Dog does not lick or ingest the product. If dog ingest, vomiting should be induced. Treat dogs and puppies 7 weeks of age and older.Discontinue use if skin becomes irritated or inflamed.